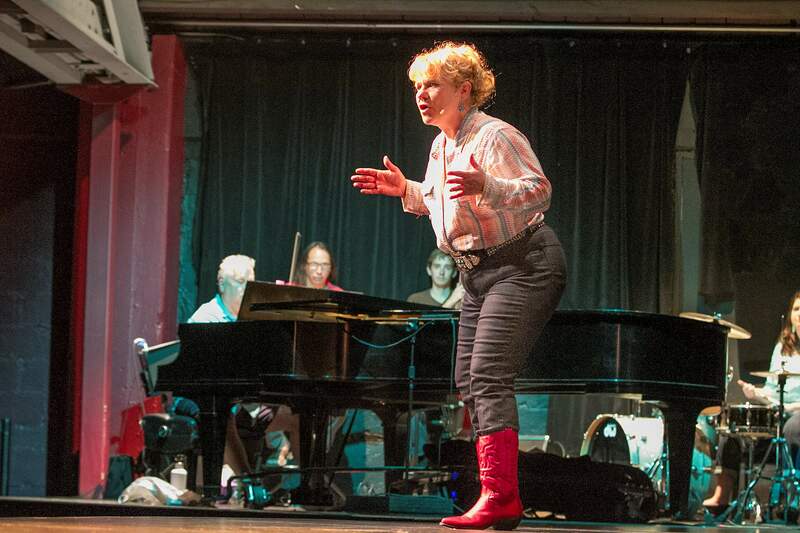 Traci Lyn Thomas plays Patsy Cline during a rehearsal for “Always...Patsy Cline” that will be part of the 5th anniversary revival that includes original cast members at the Durango Arts Center. 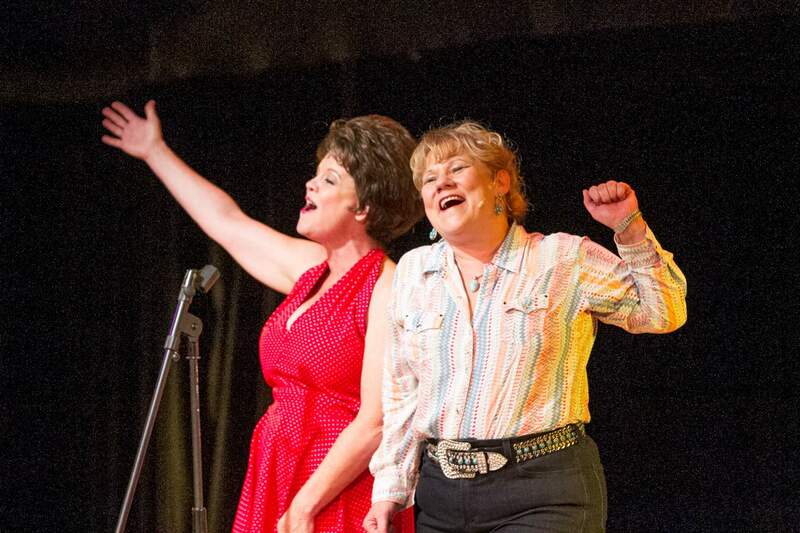 Traci Lyn Thomas playing Patsy Cline, left and Mary Ellen Cerroni playing Louise Seger, right, during a rehearsal for “Always...Patsy Cline” that will be part of the 5th anniversary revival that includes original cast members at the Durango Arts Center. With the band behind her, Mary Ellen Cerroni plays Louise Seger during a dress rehearsal for “Always...Patsy Cline” that will be part of the 5th anniversary revival that includes original cast members at the Durango Arts Center. Five years ago, Traci Lyn Thomas and Mary Ellen Cerroni were strangers playing best friends in a musical play as unfamiliar to them as they were to each other. Five years later, they are good friends and great stage-partners-in-crime, playing the same characters in a production they’ve performed dozens of times. 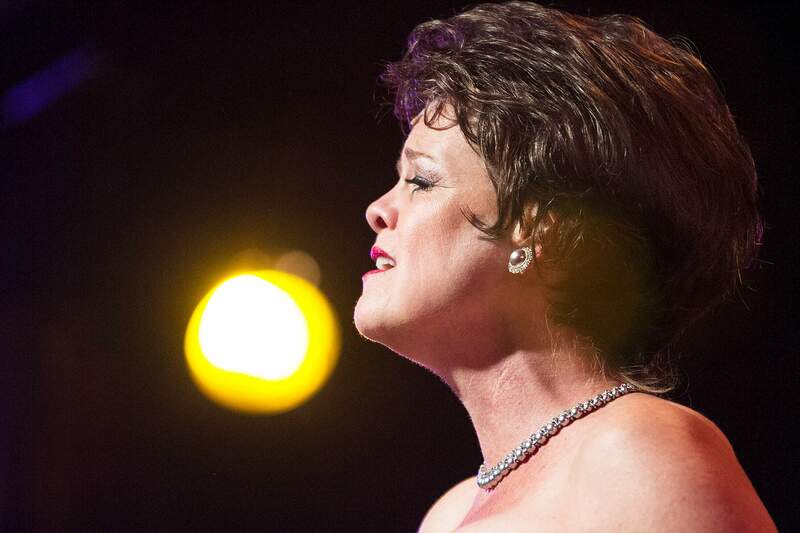 Thomas and Cerroni return to the Durango Arts Center for the revival of “Always…Patsy Cline,” five years after the first run. The show begins Thursday and runs for two weeks only. The musical play, written by Ted Swindley, centers on the true story of the relationship between Cline and a Houston housewife/fan-turned-friend, Louise Seger, just as Cline was coming to know stardom in the late 1950s. Returning with Thomas, who plays the iconic Cline, and Cerroni, who plays Seger, are director Theresa Carson, music director Scott Hagler as well as Diane Welle’s brilliant costumes. Despite the familiarity, the revival is no reunion for Thomas and Cerroni. After the first run of “Always,” the two stayed in touch, became friends (as did their husbands) and visited each other’s homes. The experience of the first run and the friendly, shared comfort and chemistry between them has made preparing for the revival much easier, a process that required just nine rehearsals as opposed to, say, the 30 typically required for such productions. The preceding five years have brought changes for both Thomas and Cerroni, changes that have resulted in different approaches to their performances. Some of them are physical – voices, knees, backs – the product of being five years older. But each actress is in a different place, physically, emotionally or otherwise. Thomas, whose crisp and soaring vocals couldn’t have aged a drop, since has moved from Durango to Boise, Idaho, then to Concan, a speck of a town in Texas Hill Country. Cerroni, who still lives in Farmington, endured a couple of surgeries and had to quit her job teaching elementary school music to care for her aging parents. The changes have brought new understanding to the production with which they’d become so familiar. Thomas agreed, adding that having done the show for almost four months the first time around has brought a more thorough understanding to the production. “You change it up a little bit, add a little more depth to it, because it’s not just about learning the words and getting it up there, it’s about going a little further into the characters,” she said. Lest anyone who saw the original DAC production think they can bypass the revival for been-there-done-that reasons, the current production brings plenty of changes. The biggest introduces projections of vintage backdrops and locales in lieu of more traditional sets and staging. Director Carson said the change was made to give the production a firmer sense of nostalgia and place, like The Grand Ole Opry’s Ryman Auditorium circa the late 1950s or the honky-tonk bar in the Esquire Ballroom in Houston, Texas. Despite breathing life into the revival, adding the projections has presented challenges for Thomas and Cerroni. Before, they had more props to guide them through scenes, props that provided comfort and security, like salt and pepper shakers, coffee cups, silverware. Some of the image projection changes that. The show, which opened Thursday, runs through June 28 with performances at 7:30 p.m. Thursday, Friday and Saturday and matinees at 2 p.m. Saturday and Sunday. The 2010 production had an extended run and was performed well into September. This time around, audiences might not want to dilly-dally. It is said in the biz that you shouldn’t put on the same production in the same theater for at least 10 years. 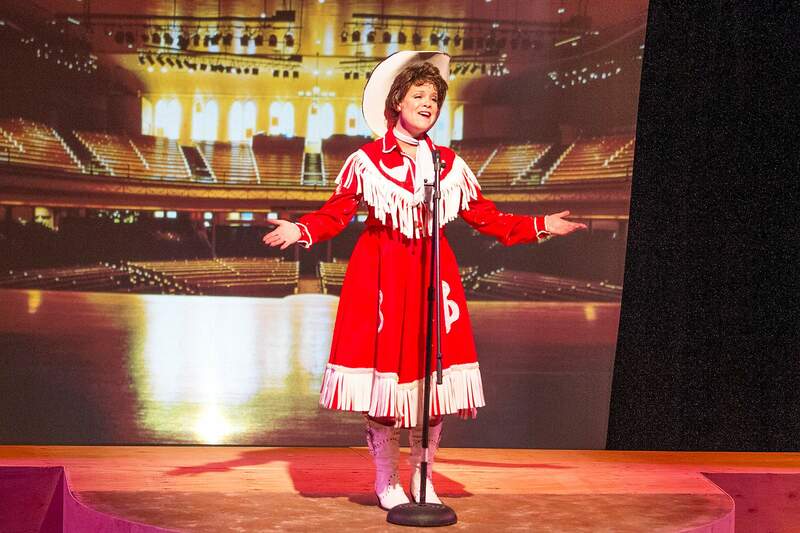 Theresa Carson, who is returning to direct the revival of “Always…Patsy Cline” after just five years says, well, she’s cool with that. People are still talking about the first run, Carson said, and the requests for a revival have been numerous. Sprinkle on the serendipitous availability and experience of both original cast members and add the delightfully round number of five (years), and the decision just seemed to make sense with everything seeming to fall into place. However, after discussing the timing and anniversary and the confluence of availability, Carson said her decision to reboot “Always” again so soon was more than that. It’s about the story itself, one about friendship, graciousness and kindness of spirit, a story we need to hear again, a story that resonates even more now than it did five years ago. “(Cline) was becoming famous. She didn’t have to give (Seger) the time of day and she did,” Carson said. “They learned from each other. They found this connection. It’s a good lesson in life though: We’re all connected. We all have a gift for each other if we open ourselves up to it. And that’s what happened (between) Patsy Cline and this housewife from Texas. “Always ... Patsy Cline,” a musical play by Ted Swindley, directed by Theresa Carson, starring Traci Lyn Thomas and Mary Ellen Cerroni. Show times are 7:30 p.m. June 18-20 and 25-27 with 2 p.m. shows June 20, 21 and 27, 28 at the Durango Arts Center, 802 East Second Ave. Tickets cost $21 for DAC members, $24 for general admission for adults and $18 for children 16 and younger and are available at the DAC box office or online at www.durangoarts.org/theatre/patsy-cline. For more information, call 259-2606 ext. 13.